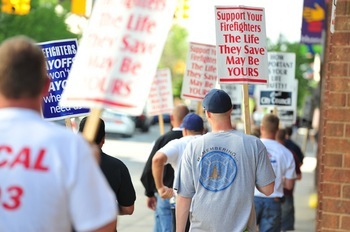 Firefighters picketed outside of the downtown fire station in protest of the city of Ann Arbor's proposal to eliminate 20 firefighters' jobs in July. Matt Schroeder says a house fire on South State Street that killed a 22-year-old college student last month still haunts Ann Arbor firefighters. "That fire has impacted a lot of us guys for the rest of our lives and we don't want to see that happen ever again," he said. "It impacted me to know that life is fragile and that we needed everybody on that scene." About three dozen firefighters from Ann Arbor and other parts of the state picketed outside the downtown fire station on Monday, protesting pending layoffs in the Ann Arbor Fire Department. The firefighters union hosted the informational picket to raise public awareness of the city's plans to potentially lay off 20 firefighters in July to help close a gap in the 2010-11 budget. "We're out here today to try to let the citizens know what impact losing firefighters would have on the citizens and our ability to provide them with service," said Schroeder, union president. "We believe that the fire department's treated unfairly with us expected to take a 15 percent cut in our funding. And actually we're going to have a 22 percent loss in our ability to provide service." The picket continued into Monday evening's Ann Arbor City Council meeting. Several firefighters made their way across the street to city hall to attend a public hearing on the city's 2010-11 budget where public safety was on the minds of many residents who spoke. The council will vote on the budget on May 17, but it was announced Monday night that there may be amendments to save the jobs of police officers and firefighters. Firefighters drove in from cities throughout the region to march in Monday's picket line. Some came from fire departments in Flint, Battle Creek, Dearborn, Dearborn Heights, Lincoln Park, Taylor, Ann Arbor Township and Ypsilanti. 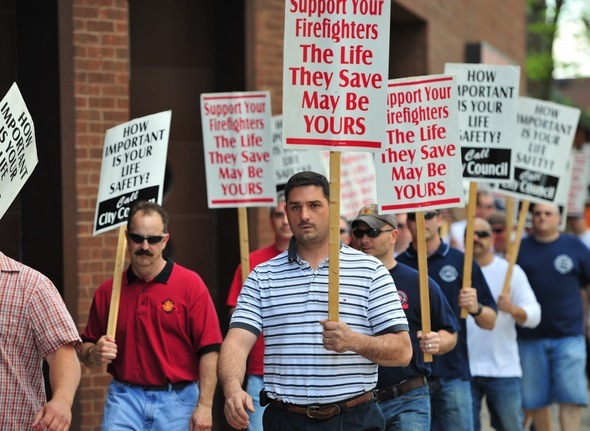 Andre Doser and Shaun Kelly, both firefighters from Battle Creek, carried signs that read: "Support your firefighters. The life they save may be yours." "We had nine guys laid off in our own city," Doser said. "We're actually two of the nine that were laid off and we just wanted to make sure that it doesn't happen to other cities. Since they laid off nine guys a week ago, they've had our truck out of service and it's kind of put us in a tight spot for commercial fires. It's just reduced the fire protection for our city." Firefighters march up and down South Fifth Avenue in front of the downtown Ann Arbor fire station across the street from city hall. "When we were out picketing, we had some other cities come out and support us, so we want to do the same to make sure that nobody has the same fate that we got in Battle Creek," Kelly said. "If this can help and maybe prevent that, that's why we're here." Michael O'Hearon, an attorney who represents firefighters across the state of Michigan, criticized Ann Arbor city leaders. "If I were on the City Council, I'd be kind of embarrassed that a city like Ann Arbor is closing fire stations and laying off firefighters while they're spending money on contractors to build up nice offices," he said. "The priorities certainly need to be readjusted." Steven Heim, a firefighter from Lincoln Park, said there are talks of cutting firefighters in his city, too. "We're out here to support our brothers," he said. "We understand their fight and are here to back them. We're facing the same thing from where we're at. The state's in hard time, so we've been faced with the same talk of cuts and reductions in manpower and the citizens need us more than ever." Members of the IAFF Local 693 firefighters union in Ann Arbor say the proposed cuts to the fire department would reduce the ability to not only fight fires, but also provide other vital functions — such as protecting the environment from hazardous materials releases, protecting citizens from downed electrical lines during storms, rescuing canoeists from the river, and performing life-saving emergency medical services. There currently are a minimum of 18 firefighters on duty across the city’s five stations. In addition to eliminating six firefighters from each shift, the department's only 95-foot ladder truck would come out of service, the union claims. Support functions within the department also would be cut. The union claims the chief is planning to eliminate one of two assistant chief positions. They say he also is planning to eliminate the department’s only mechanic who, in addition to coordinating all testing and repairs on the department's vehicles, is responsible for repairing all portable equipment, coordinating maintenance and ensuring life safety equipment operates in compliance with state regulations. National standards require that a fire department be capable of delivering 15 firefighters to a scene of a house fire within 8 minutes of being dispatched. A study conducted in 2008 revealed that the Ann Arbor Fire Department was capable of meeting that goal in only about 61 percent of the city, and only if all the trucks are in their stations and not out responding to other calls. The firefighters union claims the map below shows that the department already is not meeting those safety goals in residential areas on the outskirts of the city with the current staffing. 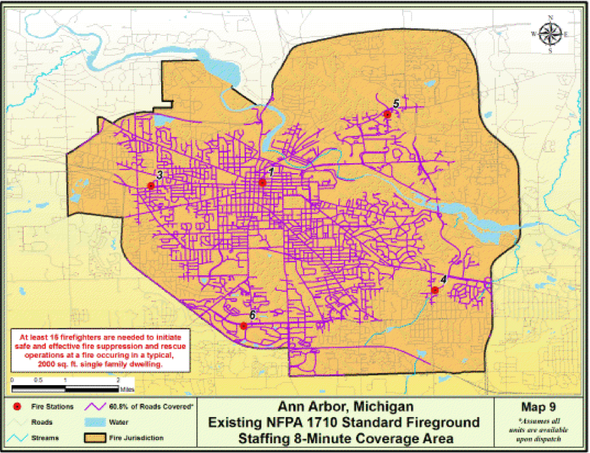 Since 2002, seven citizens have died in fires in Ann Arbor. During the same time period, 13 more people have been rescued from their homes by firefighters, and 10 more citizens have had to jump from roofs and windows before any firefighters could get to them.